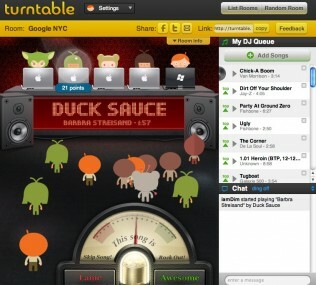 Turntable.fm, the digital music start-up that got a whole lot of buzz last summer, now has deals with all four of the big music labels. The company was slated to announce the pacts — with Universal Music Group, Warner Music Group, EMI Music Group and Sony — at the South by Southwest conference today. CNET reported on Turntable’s Warner deal last week, and I think that report helped accelerate today’s announcement. The fact that Turntable was able to get deals done in less than a year — the company is the result of a well-documented pivot from something called Stickybits — says a lot about the newfound flexibility on the part of the music business. Especially since Turntable has carved out a new business model — basically a hybrid between “on-demand” services like Spotify and “radio” services like Pandora. The flip side is that the buzz and momentum Turntable was generating last summer has gone away. That may be due mostly to Spotify’s U.S. launch, which by all accounts has been a huge success. But it may also be because not that many people want to listen to other people play music. I do, though, so I hope the deals give Turntable the ability to turn things around. Right now, when I visit the service I don’t see any of my pals there. And while I’m sure I could find some cool people playing cool songs there if I dug around for a while, I don’t want to do a lot of digging. One thing the deals won’t do is give Turntable the ability to open its doors to users outside the U.S. But it does give the company a better chance of getting international deals done. That would give Turntable a leg up on rival Pandora. But there are a gazillion legal ways to get your hands on digital music, for very little money these days — from Spotify to Rhapsody to iTunes Match to Deezer. Getting heard above that din will be a challenge.